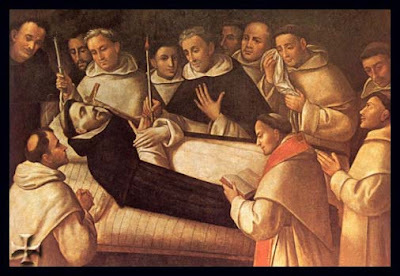 Today the Dominican Order celebrates the day when, 12 years after St. Dominic's death, the brethren opened his coffin as part of the proceedings for his beatification. In some parts of the world this feast, rather than August 8th, is the major Solemnity. Today for Office of Readings we read Bl. Jordan of Saxony's account of this day. Bl. Jordan was St. Dominic's successor as Master of the Order of Preachers. Nearly 800 years later the irony and humor of the account is not lost on us and every year hearing it always elicits a few smiles! From a letter of Blessed Jordan of Saxony, priest and second Master of the Order. Divine goodness is accustomed, in its unsearchable wisdom, very frequently to delay the manifestation of virtue—not, to be sure, so that it may slip into oblivion, but rather that, after having been hidden, it may be revealed with more splendor at an opportune moment. Therefore, whether God would reserve greater benefits to his Church, or for some other reason, some brethren (whose simplicity outweighed their prudence) decided that it would be quite sufficient if the glory of Saint Dominic, the servant of God most High and the founder of the Order of Preachers, were known to God alone, and that it was not worth the effort to bring that glory to human attention. Others, however, thought differently: but since they were fainthearted, they offered no opposition. So it is that for nearly twelve years the glory of our blessed father Dominic has remained hidden, without any regard for his holiness. The treasure was hidden, of no use to anyone. 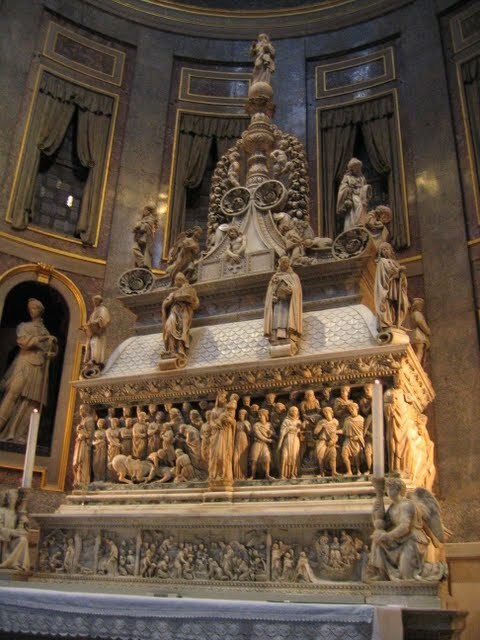 Dominic’s virtue has been manifested numerous times, but it was covered over by the negligence of his sons. The upper part of the coffin was moved a little bit. As soon as the stone was taken away, the body gave forth a wonderful odor through the opening; its sweetness astonished those present, and they were filled with wonder at this strange occurrence. Everyone shed tears of joy, and fear and hope rose in all hearts. We ourselves also smelled the sweetness of this perfume, and we bear witness to what we have seen and smelt. Eager with love, we remained devotedly near the body of Dominic for a long time, and we were unable to sate ourselves with this great sweetness. If one touched the body with a hand or a belt or some other object, the odor immediately attached itself to it for a long period of time. The body was carried to the marble sepulcher where it would rest—it and the perfume that it poured forth. This marvelous aroma which the holy body emitted was evidence to all how much the saint had truly been the good odor of Christ. The Archbishop of Ravenna celebrated the Solemn Mass. It was Whit Tuesday [the Tuesday after Pentecost], and the choir intoned the Introit of the day: “Receive the joy of your glory, giving thanks to God who has called you to his heavenly kingdom.” In their exultation the brethren regarded these words as if they were a witness from heaven. The trumpets sounded, the faithful lit countless candles, the procession went forth solemnly. On all sides the acclamation “Praised be Jesus Christ!” resounded. St. Dominic's tomb at the Church of St. Nicholas in Bologna.